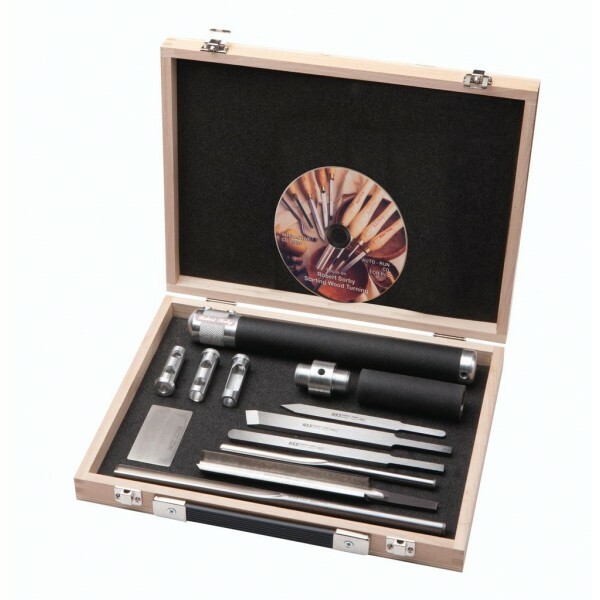 This value added box set includes the same tools as the ever popular 67HS but with the benefits afforded by the Sovereign handle and extension – effectively two handle sizes in one. This set also features the Focus on: Starting Out Woodturning DVD and our new handy credit-card-sized diamond honing stone – perfect for creating an edge on flat tools. ” Spindle Roughing Gouge 3/4″ (843) – turns square to round, a real work horse. ” Spindle Gouge 3/8″ (840) – details spindle work. ” Bowl Gouge 3/8″ (842) – makes light work of bowl turning. ” Standard Parting Tool 1/8″(830) – for parting off work and great for detailing. ” Round Nosed Scraper 1/2″(820) – just the job for bowls and platters. ” Sovereign 4″ extension (SOV-EXT) – handy addition to increase handle size to 17″. ” Diamond honing card (DSCC 600) 2″ X 3″ 600 grit. ” Robert Sorby Focus on: Starting Out Woodturning DVD (RSDVDSO).